Announcement Current ship time: 5-7 business days. For the doll who needs more than something mass produced, Lizziebee Design provides high quality, unique 18" doll clothing and accessories for dolls such as American Girl. Free shipping everyday with purchases over $25! Use coupon code 25SHIP at checkout! Celebrating 9 years of wonderful customers and fantastic creations. Orders will ship within 5-7 business days of purchase depending on size and complexity of the order. We are not affiliated with or endorsed by American Girl or Mattel. Current ship time: 5-7 business days. super cute! perfect for my daughter's AG doll. Absolutely love the two head bands I received!! The colors are beautiful they came right away and before Christmas as they are a gift. What a cool shimmering color these are. Beautiful with blonde hair as well as dark. Thanks. These do look like sunshine. Very pretty and well made. Thanks. These are a fresh lovely color and will look nice with dark hair especially. They are well made. Thanks. 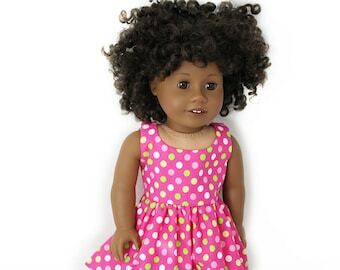 Lizziebee Design is a one-woman studio specializing in handcrafted, quality clothing for American Girl, Springfield, Madam Alexander, Our Generation, and other 18" soft-body dolls. The studio is owned and run by Lizzie, who has been sewing for over fifteen years. She received her first American Girl doll in 1991 and has been hooked ever since. After starting out making clothing for her own dolls, Lizzie branched out into the collectors market, selling to fellow American Girl fans before taking the plunge to start her own Etsy store and sell to 18" doll fans everywhere. In 2010, Lizziebee Design became a Liberty Jane Clothing Premier Partner, selling authorized items made from Liberty Jane patterns in addition to original designs from Lizzie herself. I come from a long line of crafty and creative women who have inspired me to start my own business based on my love of the dolls I've collected since childhood. Sewing for them is a labor of love and I wouldn't change that for the world.